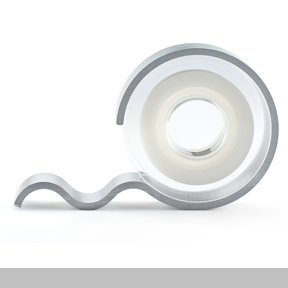 The notchless is an adhesive tape dispenser for MagicTM Tape. It cuts adhesive tape in the same way as conventional tape dispensers but leaves a straight edge, not a zigzag one. Tape cut with a straight edge looks better and does not leave behind stickiness or dirt. Having a straight edge also prevents pieces from splitting off when tape is removed, as happens with a zigzag cut.